Eastern Michigan University professor Dr. Allen Kurta discusses his study concerning the arrival of white-nose syndrome; a devastating wildlife disease that has killed 80% of the state’s cave hibernating bat population. After years of neglect a recent settlement provides Flint, MI with $87 million dollars to replace toxic lead service lines in 18,000 homes. Dr. Timothy Davis with the National Oceanographic and Atmospheric Administration’s Great Lakes Environmental Research Laboratory explains how he’s working to predict if and when an algal bloom will become toxic. The S.S. Badger is the last coal fire steam engine ship on The Great Lakes. It has been upgraded to a storage hydroelectric powered collection system. It functions as a passenger vessel between Wisconsin and Michigan. Pumped hydroelectric energy storage (PHES), is a method of storing energy using the gravitational potential energy of water, pumped from a lower elevation reservoir to a higher elevation. During periods of high electrical demand, the stored water is released through turbines to produce electric power. The industry and shipping on the Great Lakes built the American economy. But they also had unintended consequences including pollution and invasive species. Politics and science have sometimes come together to find solutions. Go aboard a boat called “The Clinton” as it carries youth onto the lakes for the Summer Discovery Cruise, Great Lakes science for kids. Helping youth realize how important water is and what plant and animal life lives in it is the part of this day trip. The Pokagon Water Walk connects Potawatomi Indians with the culture and environment of the water of the Great Lakes. The Flint Water Crisis in 2014 shone a light on drinking water problems all across the U.S. In this video, greatlakesnow.org interviews Michigan journalist and author Anna Clark who wrote a book called “The Poisoned City” about the complex issues that created the lead contamination in Flint’s municipal water supply. Without Dr. Mona Hannah-Attisha, the pediatrician turned best-selling author, the high lead levels in Flint, Michigan’s drinking water in 2014 may never have been discovered. Great Lakes Now talked with her about her book and some of the struggles she faced uncovering what’s considered the worst drinking water crisis in U.S. history. Deep in the woods on the grounds of Michigan’s Leslie Science and Nature Center, you’ll find a unique educational laboratory: a vernal pool. Vernal pools are seasonal ponds the fill up with spring rains, and then drain away in the fall, but all summer long they offer a unique place to learn about human impacts on aquatic life and water quality. Kristen Mayer studies mayfly season and welcomes them back to the western basin of Lakes Erie, after their long absence because of pollutants contaminating the lake. 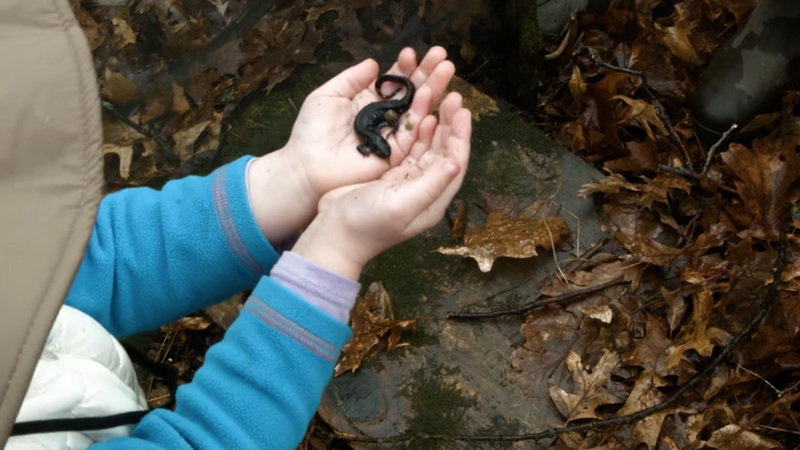 Dr. Katherine Greenwald studies salamanders with the hope of using them as an early indicator of habitat degradation. The Pokagon Band of Potawatomi Indians who were never removed from their ancestral lands in Michigan but saw their environment and way of life fractured over time. A small group of tribal citizens fought for decades to keep traditional ways alive, the tribe has even launched a series of cultural preservation and environmental restoration efforts. In her Pulitzer Prize-winning book, “The Sixth Extinction: An Unnatural History,” Elizabeth Kolbert chronicles previous mass extinctions and compares them to today’s changing climate. Here she discusses some specific threats to the Great Lakes System: shoreline development, waste dumping. A summer on Lake Michigan during his childhood shaped Jerry Dennis and his writing. His rule for himself as a book author? To write about “things he cares about,” and that’s why so much of his work is about the Great Lakes. When heavy rainfall hits impenetrable surfaces, the stormwater runs into sewage systems. But when rain lands in bioretention gardens, it is better controlled and can benefit plants. Designed by Joan Nassauer, professor of landscape architecture at the University of Michigan, these gardens are creating ecological benefits in attractive green spaces. Michigan State University is offering a two- day workshop called “Michigan Water School: Essential Resources for Local Officials” to elected and appointed officials and their staff members. The courses are taught by MSU professors and educators. What is PFAS? Where does the chemical come from? What can it do the human body and to animals? Great Lakes Now decided to go looking for answers, and you will be surprised by what they discovered.